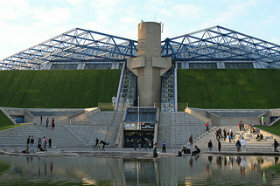 The early January tournaments were warm-ups for the main event of the month, which was the first Grand Slam of the year – the Australian Open. With a ranking well inside the top 100, Andy was guaranteed entry into all the Grand Slams and didn’t have to worry about qualifying any more. But his debut appearance in Melbourne was short lived, ending in a first-round defeat to Juan Ignacio Chela. With that, his Australian adventure was over until the following year. His next tournament took him all the way back to Europe – nearly 10,000 miles away – to Zagreb, Croatia. The draw wasn’t kind to him: he was up against wold No. 5 and local favorite Ivan Ljubicic, and lost in three sets. It had been a long way to go for another first-round defeat, but that was part and parcel of being a professional tennis player. Sometimes things don’t go your way, sometimes they do – as Andy was to find out in his next event. After he had travelled another 6,000 miles to get there, of course! 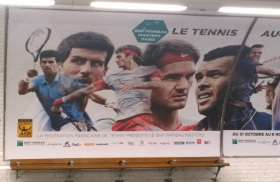 Andy had a new travel companion for his trip to the SAP Open in San Jose, California. Normally he went to tournaments with his coach at the time, Mark Petchey, or his mum, Judy, and sometimes both. Neither had made the journey across the Atlantic this time; instead he was accompanied by his girlfriend, Kim Sears. 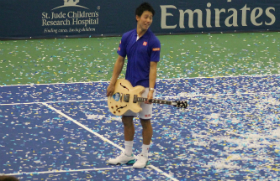 Kim, also 18, had first met Andy at the previous year’s US Open. A student at the University of Sussex, she had an artistic side, having studied drama, music and art for her A-levels at school. Yet while Kim might not have been a fellow tennis pofessional, she certainly had the sport in her blood. Her father Nigel was a top British tennis coach (in 2011 he became the coach of former world number one Ana Ivanovic). This was the first time Kim had travelled with Andy to a tournament. 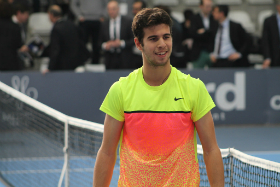 Could she be a good-luck charm as he tried to win his fist ATP title? It cerrtainly appeared that way in the early rounds as her boyfriend beat Mardy Fish for the loss of only four games and was no less dominant against Jimmy Wang, conceding six games. Robin Soderling won the first set of their quarter-final clash, but Andy bounced back to book a spot in the last four. He would need more than just good fortune to advance to the final, however, as he was up against a formidable foe in Andy Roddick – the player with probably the most lethal serve in the world. The top-seed was the highest-ranked opponent he had faced since Federer, but that didn’t bother Andy. 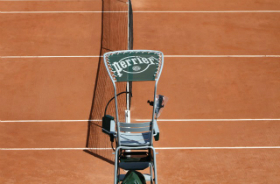 he refused to wilt under pressure and won 7-5 7-5. It was the highest-profile victory of his career so far. Admittedly, not many of Australia’s Grand Slam titles had come in the past 20 years, but one player who had taken home a couple was facing Andy on the other side of the net. In 2001, the year he had won the US Open, Hewitt had become the youngest ever world No.1, aged 21. The Australian, who was now ranked 11, had not won a tournament since 2003. He began the final with the drive of someone who wanted to change that – fast. Hewitt took the first set 6-2. Murray then gave him some of his own medicine, winning the second set 6-1 to level the match. The third was much closer. Hewitt showed incredible resolve at 4-5 and 5-6 to hold off two championship points, both times finding a thunderous serve when he needed it most. That took the match to a tie-break, where it was third time lucky for Andy: he grasped the opportunity on his third match point and became the youngest ever Brit to win an ATP Tour title. 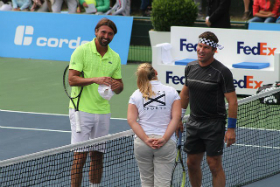 After shaking hands with his opponent and the umpire, it was time to thank his biggest supporter all week. He went and gave Kim a kiss. 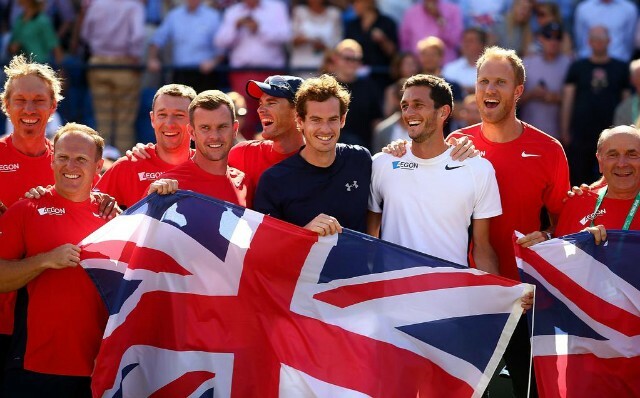 Led by local hero Andy Murray, Great Britain have reached Davis Cup semi-finals for first time in 34 years. They’ll next face Australia, who beat Kazakhstan, in September. Q: Who are you Leon Smith, what is your background? My background is not conventional, it’s not the story that everyone knows, the former good player who becomes coach. I was a very average player in Scotland. I still live in Scotland, Edinburgh. I played at British level in juniors (he never played on any professional circuit) but I soon realized that I won’t make it. I went back to school. I finished my studies. Without a degree, I must admit (laughs). And so, I started coaching, at 17. Judy was national coach in Scotland at the time. She thought her son needed someone else than Mom to train him. Someone to accompany him during tournaments. This son was Andy. 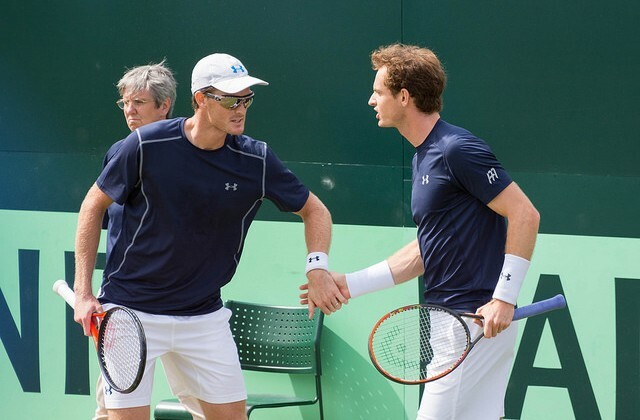 So you were one of the first coaches of Andy Murray? Yes, from age 12 to 17. Even when he left for Spain, for the Sanchez Casal Academy, I was still working with him. We stopped just after his victory at the US Open juniors (in 2004). I was with him when he won the Orange Bowl (12 years and under, in 1999). This was my first trip with him; in Miami, during four weeks, we learned to know each other. 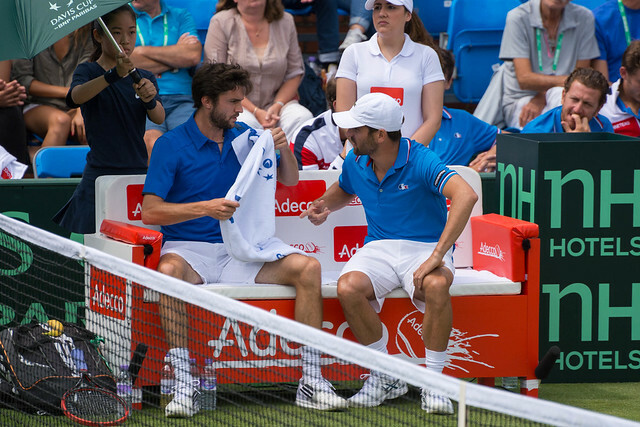 I was his coach but I was also doing his laundry, I washed his socks, I prepared his meals… After Andy, I did not do anything for a few months before accepting my first job at the LTA (the British Federation). I had to supervise coaches and players in Scotland. And I had the responsibility of the British under 14. Then I worked with juniors. It was great because in 2005-2006, there were people like Paul Annacone (former coach among others of Pete Sampras, Tim Henman, Roger Federer…) working for the LTA. I spent a lot of time with Paul and learned a lot. But how did you become Davis Cup captain? In 2010, John Lloyd had just finished his term as captain. And then I got a phone call from one of the LTA bosses. I even gave them a list of names. But then insisted (laughs). I accepted, knowing people would cringe. I would be criticized for months. I was ready for that. Have you been criticized as you expected it? Yes. The first two weeks, it’s been difficult. I remember one day I was driving and my father called to ask me: “Are you okay? Do you feel good?” As I did not understand why he asked me this, he said, “You, you did not read the papers. You better take a look.” I did. And it was embarassing. But they were right! It was up to me to show what I was capable of. I started travelling. 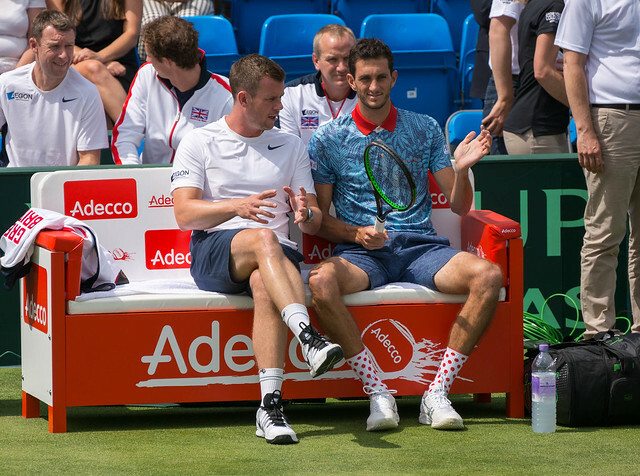 I went everywhere with Andy of course, but also on the Challenger tour with James Ward and Daniel Evans, where I served as their coach because they had no money to pay one. 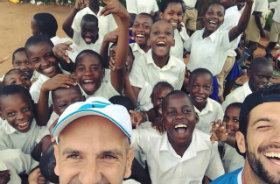 I took young coaches with me and we all grew up together. We were in Third Division. No matter against which team you win, you win and things take shape. We beat Turkey, Tunisia, Luxembourg and Hungary to reach Division Two. In 2012, we missed the lift to the World Group against Belgium, but not the following year against the Russians, without Andy. Suddenly people took us seriously. When we played Tunisia in Bolton in 2010, there was no TV broadcast of the tie. To debrief the match I had one amateur video. 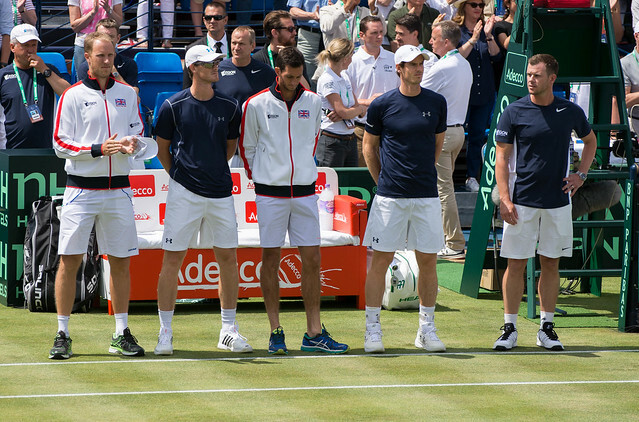 Today, interest in the Davis Cup is undeniable. Of course, he is really concerned. His dedication drives the other players but also the entire nation. We are a united team. We dine quite often together, we were almost all at Andy’s wedding (in April). He is also the first to encourage his teammates. 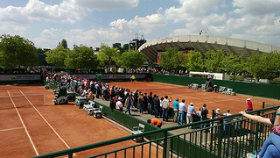 At Roland Garros he came in the stands to support Kyle Edmund in the qualifyings and in the first round. 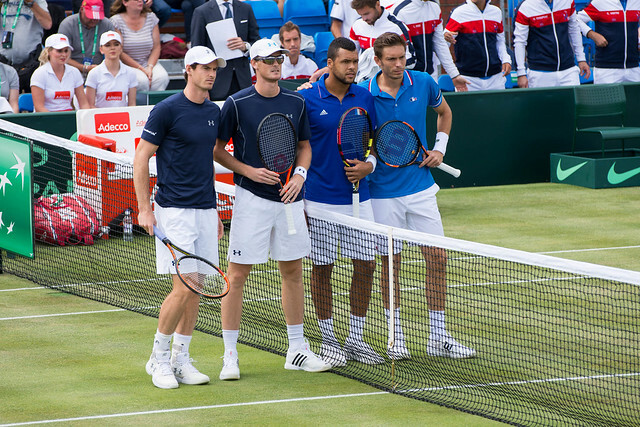 Less than a week after Wimbledon, the Queen’s Club hosts the Davis Cup quarterfinal between Great Britain and France. The winner will face Kazakhstan or Australia in the semifinals in September. 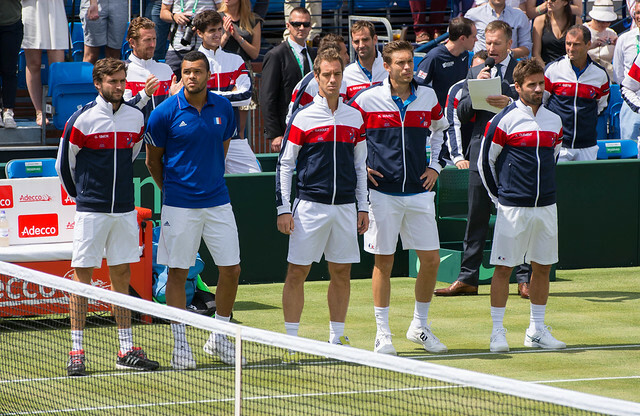 With 3 top 20 in their team and a doubles specialist, France is the huge favorite, but in Davis Cup you never know what might happen. 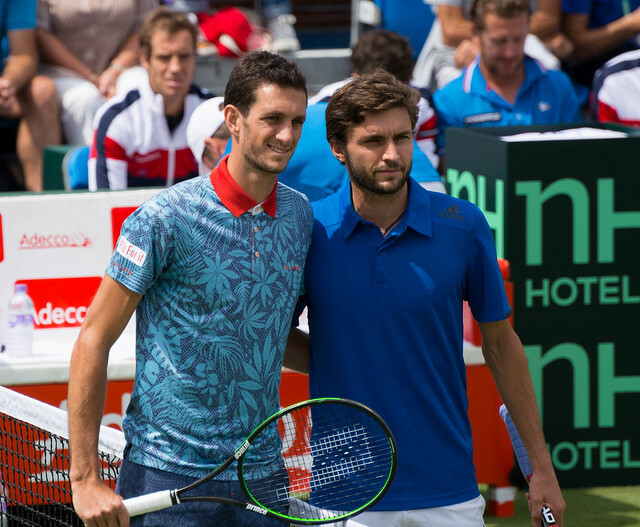 Last March, James Ward pulled off the biggest win of his career, beating John Isner in a marathon 6-7 5-7 6-3 7-6 15-13 match in the Davis Cup first round tie against USA. 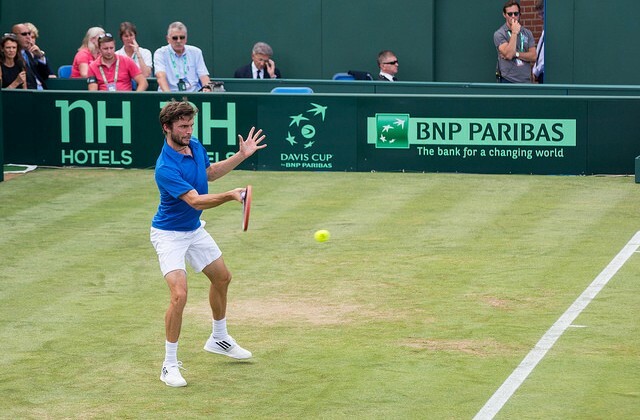 But this time, he didn’t cause recent Wimbledon quarterfinalist Gilles Simon too many problems. Simon wins in straight sets 6-4 6-4 6-1 in under two hours, and that’s 1-0 for France.